On Thursday the 29th of March the Stranraer and Wigtownshire service held an art event to reveal a wall hanging that had been created by the people we support and carers. The final outcome created a piece of art that showcased the group’s skills, both innate and learned through the ten weeks. We worked together to provide the 10 sessions where the service users were supported throughout the group time to develop their skills. The final art piece is a large 2m x 1m wall-hanging which is a compilation of their imagery centred around a theme of a natural ‘flora and fauna’ scene allowing an individual focus to the artmaking in the form of birds, bugs, trees, flowers and creatures which were then sewn together to create the final piece. 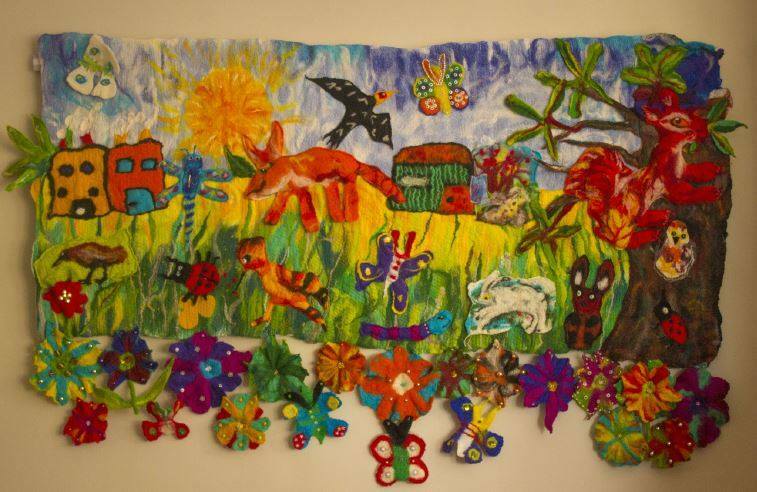 Throughout this ‘arts for wellbeing’ project, the wall-hanging brought many benefits to the participants including a sense of belonging, ownership, pride, friendship and many other aspects that are immeasurable. The group enjoyed the sessions so much they are now continuing the group.